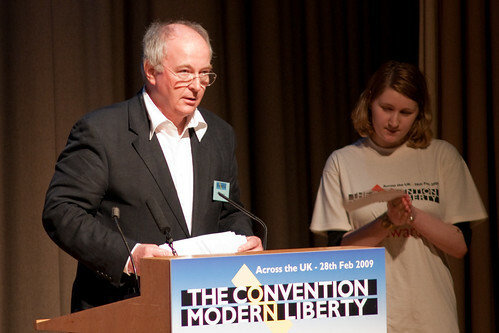 On Saturday I attended what I genuinely believe was an important event – The Convention on Modern Liberty in London. Satellite events were taking place all over the country, with the plenary sessions and keynote addresses. It was a great day with a vast array of speakers. We had to pick and choose which sessions we went to over the course of the day, with the main sessions taking place in a room nearly large enough for everyone to squeeze in. I suppose that if I’m going to highlight a few speeches, I must mention the keynotes from Philip Pullman and David Davis. As soon as videos for both of these become available I’ll embed them here. Shami Chakrabarti of Liberty, opened procedings with the day’s first keynote, followed by the first plenary as The Guardian’s Georgina Henry struggled to keep a very angry Helena Kennedy QC under control. When the long list of things that we’re no longer allowed to do starts to get expressed, you begin to realise exactly what we’re missing. Phil Booth of NO2ID spoke to us to ensure that we write to our MPs immediately about Clause 152 of the Criminal and Justice Bill. This little clause essentially allows the Government to pass any information about you to whoever it wants to. There are full details here (PDF). I then attended the Press Freedom session chaired by Joanne Cash QC (and prospective Conservative Party candidate). The first panellist was Alan Rusbridger, editor of The Guardian, who pointed out that libel in the UK costs roughly 140x more than anywhere else in Europe. He spoke about the recent case The Guardian had had with Tesco, where they did make some mistakes but tried to right them as quickly as possibly. Because it was in the elaborate area of company tax law, the end result was an £800,000 bill which included £350,000 for Tesco’s accountants to explain to Tesco’s lawyers what it was they were doing. The concern is that we no longer investigate these kinds of things, because it’s simply to expensive. Rusbridger went on to say that their recent week long series of reports on company tax had cost £100,000 “to legal.” Most media organisations simply won’t bother investigating in the first place. Tax avoidance schemes will simply go unreported. Fatima Bhutto came from Pakistan to explain what media censorship laws meant there including details behind the Prevention of Electronic Crimes Act there. Andrew Gilligan is best known for his report on “the September Dossier” on The Today Programme in 2003. He now writes for the Evening Standard. He said that there were three areas that were of massive concern to journalists at the moment: the state’s laws, the decisions of judges and the economic climate that media outlets are now finding themselves in. He said that confidential sources would find it near to impossible to provide journalists with information with their cars followed via licence plates, and their phone and email records retained. He said that the Government was really cracking down on whistleblowers. Some of the antics in the past of the red-top tabloids means that worrying about the freedom of the press is not a large concern amongst the public. Nick Cohen writes himself about what he said at the session. He talked about libel tourism including the cases of Sheikh Khalid bin Mahfouz and Roman Polanski. It’s clear that libel needs reform. Otherwise all over the world we must worry about Schillings, Carter-Ruck and Justice Eady. And he though that the blogosphere couldn’t fight this: the first sight of a legal letter will mean that either the blogger (or perhaps more likely, their host) will fold and take the offending item down. There was then an ongoing discussion in the packed room about what needed to be done. We were told (well I didn’t know about it anyway) the Reynolds defence, and the differences between paper publishing and internet publishing (1 year from printing for paper, 1 year from the date that the article is removed from the internet for libel cases!). The case of Indian artist M F Hussain was spoken about – an exhibition was cancelled following complaints from a small pressure group. The next session I attended was The Database State. Guy Herbert from NO2ID chaired this and explained in some detail what was happening. Sam Talbot Rice from the Centre for Policy Studies talked about the cost, and the data loss. I’ll read their publication “Who Do They Think We Are” published last year. He referred to Jack Straw, who has most recently been explaining to us that we don’t live in a police state. He regularly puts forward the case that in the instance when someone dies, you have to inform various parts of government. But of course we can give explicit permission for that. We don’t want to tell the government everything. Tony Bunyan from Statewatch spoke from a European perspective. Discussions have to take place at a European level first. He talked about the worrying rise of hard right and even fascist elements across Europe. He said that the forms of terrorism we’ve experienced in recent times will never destroy our way of life and liberty, but some of these new laws will! These would never have been introduced during the Cold War – because they’re too similar to what took place behind the Iron Curtain (earlier, a Polish attendee drew excellent light on this comparison). Simon Davies from Privacy International was furious and talked about naming names. He feels that there are specific individuals within the Civil Service who’s power is too great as we slide into the Database State. Finally Christina Zaba of the NUJ showed us her father’s old post-WWII ID card and said that too many people thought that this was what we were talking about when we spoke of ID cards. It’s not the card – it’s the database. Airside workers will be the first to need ID cards later this year as part of their jobs: the river is starting to flow. I noticed on my way out of the Database State session that Neil Tennant had been sitting behind me. He wasn’t alone – there were lots of members of the great and the good. Brian Eno was on the final panel, and Billy Bragg spoke in a session I didn’t attend. David Elstein and Peter Bazalgette were there as was Cory Doctorow of Boing Boing. There were lots of writers around too, and I’m sure that there were many more in amongst the everyday members of the public like myself. 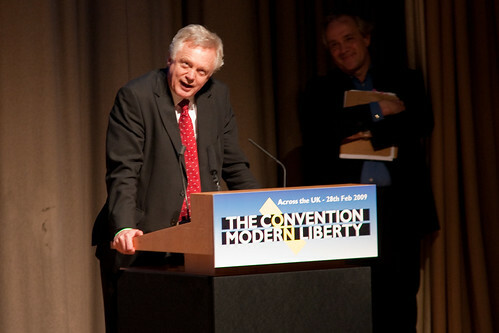 After the final panel session, we heard from David Davis who did give an excellent speech. He does believe in this stuff. All in all a worthwhile day. I could probably have done without the poor England performance in the rugby afterwards, but that wasn’t the convention’s fault. Although there was the suspicion that it was just a large group of Guardian readers convening, in fact all of the major political parties were represented and not everyone’s ideas were the same. What was and is clear is that we’re slipping into something we really don’t want, and we need to act now, because as Davis said, by the time we’re actually in a police state, it’s too late.